Do you want to see a turquoise lake with a waterfall coming from surrounding glacier peaked mountains high in the Peruvian Andes? 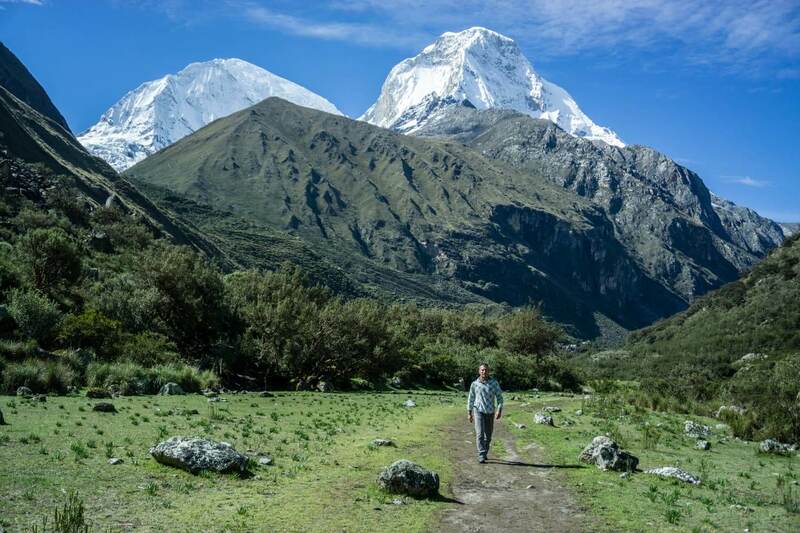 The Laguna 69 trek in the Huascaran National Park is the best day trip you can do promising exactly that and more. 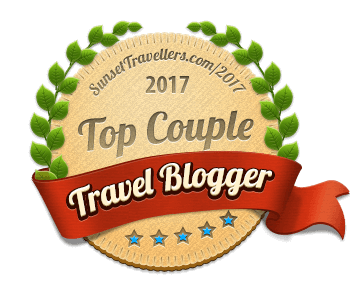 You can read about our experience below, but most importantly our tips for having the best day, coping with the high altitude and everything else you should know before you go. 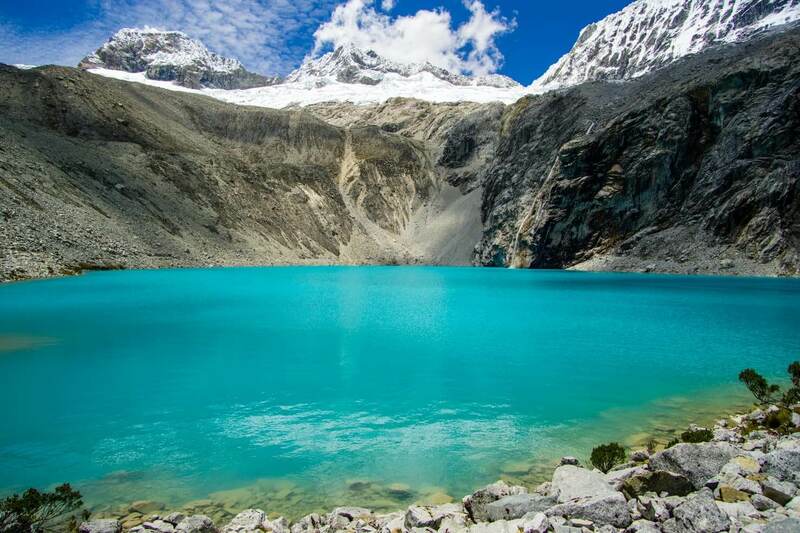 Lake 69 (or Laguna 69 in Spanish) is hidden in Cordillera Blanca mountain range. It was introduced to us as a tough and rewarding hike. Laguna 69 is the most beautiful lake we’ve seen in Peru. Undoubtedly for us, this was also the most rewarding hike ever. Why the Laguna 69 name? Before the Huascaran National Park was created in 1975, they had to name all 300 lakes that would belong into the park. Some of them already had a Quechuan name (indigenous language of Incas) and some of them were simply numbered. 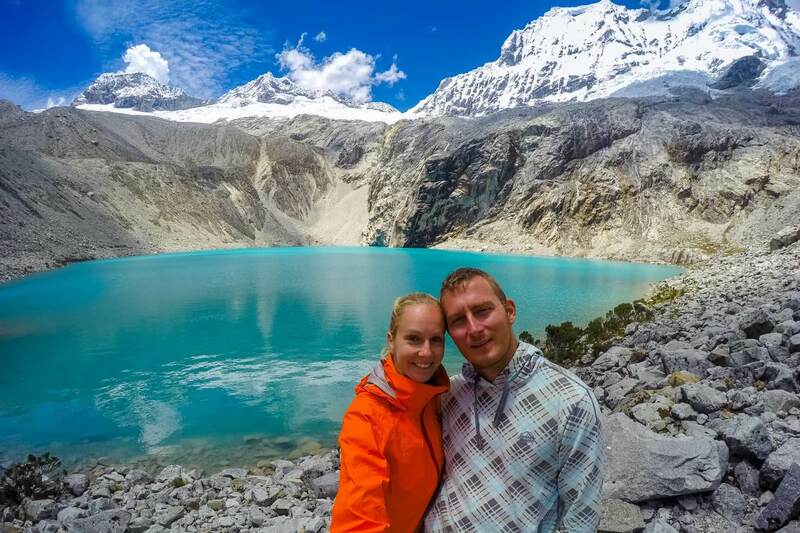 We based ourselves in Huaraz, Peru’s outdoor adventure capital, for a few weeks while we went hiking, trekking, mountaineering and mountain biking in the Cordillera Blanca. Laguna 69 trek is considered an acclimatizing hike before multi-day trekking. 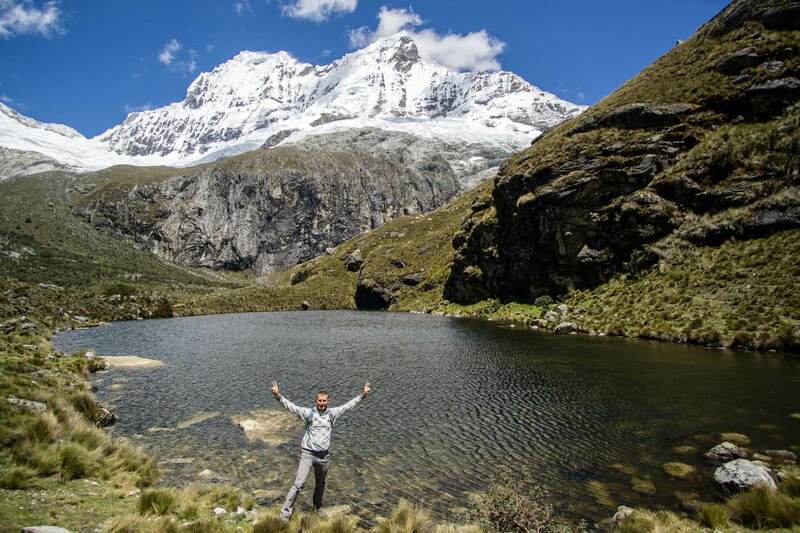 Most travelers do it when they arrive in Huaraz as their first hike. It was a smart idea to go on this hike before we did any challenging activities. 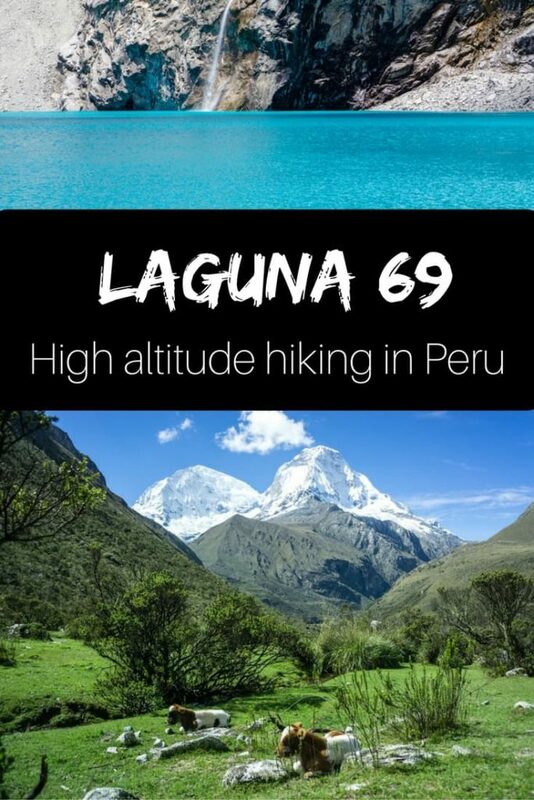 The biggest and only problem of the Laguna 69 trek is the altitude. 4,628m above sea level is well above the average of most hikes in the world. 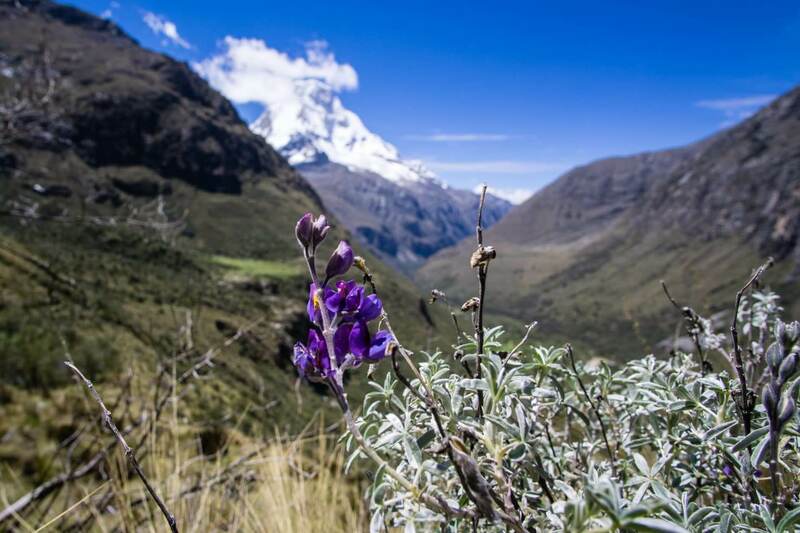 You want to come prepared for your own good, acclimatize before or after arriving in Huaraz or you will suffer. The key to coping the altitude is to acclimatize for AT LEAST a day before you attempt to do anything. Your body is not getting enough oxygen and it usually takes 1 -2 days to adjust. A headache, dizziness, and nausea are most common symptoms. Drink lots of water, avoid alcohol and walk slowly. Take over the counter pills to decrease symptoms of altitude sickness and drink plenty of coca tea but the most effective cure is acclimatizing. You can find coca leaves at street stalls, supermarkets and probably every hostel and hotel has some for their guests. Remember to take it slowly. If your symptoms get worse turn back and go down at least 500 m of elevation. Read about altitude sickness before you go in high elevation. Untreated is fatal. Prior to coming to Peru, we spent a week in Bogota, Colombia to acclimatize and prepare for Peruvian Andes. Spending a week in the city at 2,640m above sea level and running in the park occasionally prepared us for Huaraz which sits at 3,050 meters. 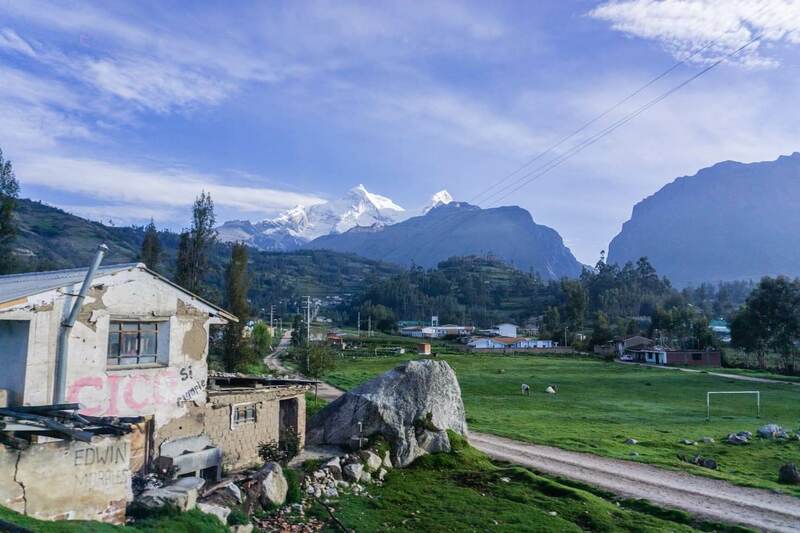 We took an overnight bus from Lima and arrived in Huaraz early the next morning. Our host in bed & breakfast greeted us with coca tea. He said it helps to cope with the altitude. Although we were feeling pretty good, a cup of coca tea certainly couldn’t hurt. Peruvians drink it every day so it must be helpful in some way. The first day was spent researching all the activities we wanted to do. While taking public transport and going hiking on your own is usually the best and cheapest option, the Laguna 69 trek is not one of them. 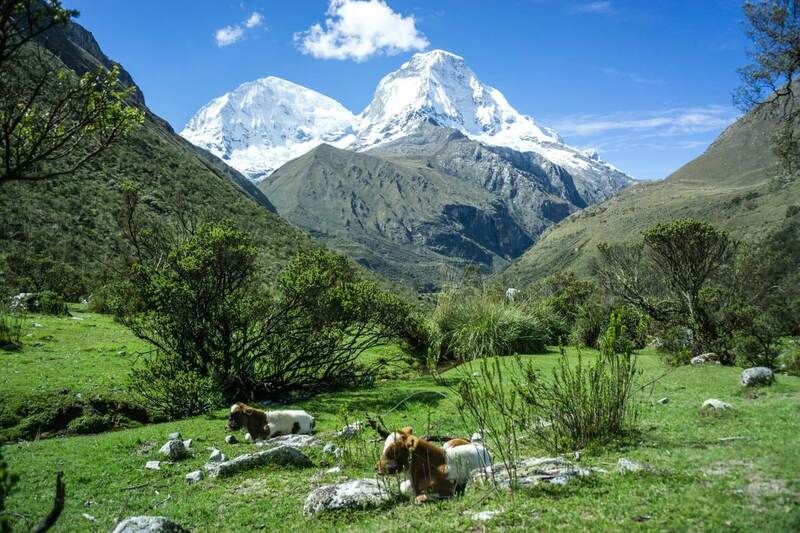 The cost of the transport to get to the trailhead and back to Huaraz is the same when you go with a tour. You won’t save anything. This is how it would go: You would need to take a public collectivo (shared van) from Huaraz to Yungay. Another one would need to take you from Yungay to start of the Laguna 69 trail which is at least another hour on a bumpy dirt road. If you’ve ever been traveling in a collectivo in South America, you know they are always cramped and don’t have enough leg room for tall people. Another issue is getting back to Huaraz. Collectivos don’t have a fixed schedule on this stretch of the road, you either hike up and down very fast and wait for the collectivo to show up or you might find yourself on the side of the road trying to hitchhike a tour bus to Huaraz. Naturally, we chose to go through a travel agency and booked the day before. Almost all travel companies offering tours and trekking also have the Laguna 69 trek. They usually have the same price – 40 soles per person (12 USD). That’s it! Round trip transport is included, a light snack and even a guide. Although it’s not necessary, he is there to make sure people don’t get sick and he carries a coca tea and first aid kit. 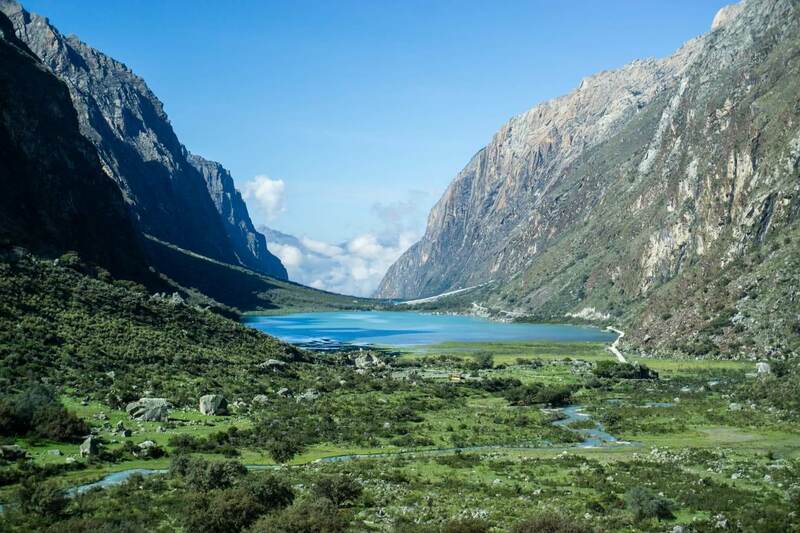 Most importantly, the guide makes sure that everyone leaves the lake by a certain time so the group can leave back to Huaraz at a reasonable time. We’ve heard of people paying the same price who didn’t have a guide and some of them ended up waiting for hours for the rest of the group. It’s a frustrating end of a beautiful day. Because people are different, often unable to realize their fitness level and capabilities, we recommend booking a tour with a guide. You will always get a better price when booking on spot but if you want to book ahead, use Find Local Trips. Wear any clothes you feel comfortable in. 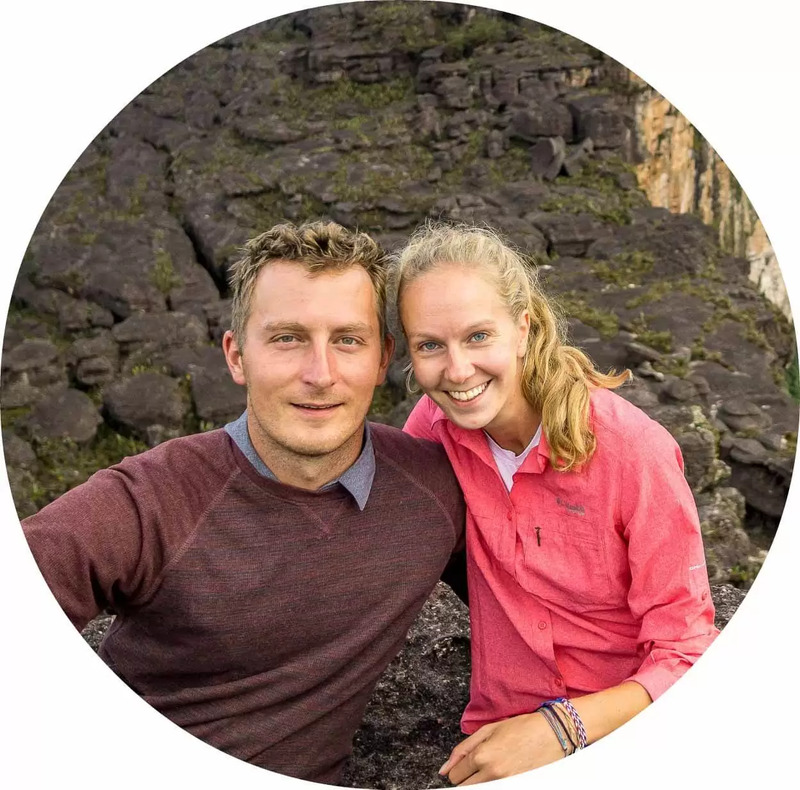 We were wearing normal hiking pants and merino shirts but because this hike is high in the mountains and we visited during the rainy season, we packed a down jacket and a rain jacket. Running shoes are absolutely fine, although we saw people wearing all sorts of footwear. What would they do if it started to rain I really don’t know. And then there are always people who go overboard geared up to climb a mountain. My two cents – whatever makes you happy. 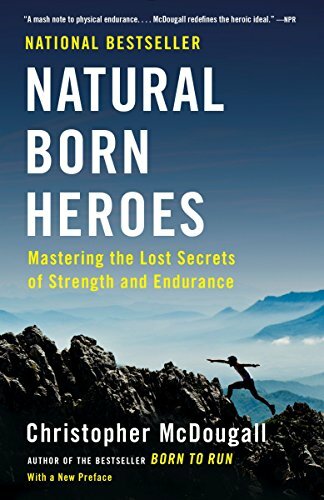 Just remember that being active and having a decent fitness level is always more helpful than having all the gear in the world. We also had a sunscreen (don’t forget the strength of the sun at this altitude), sunglasses, fruit and snacks, 1 liter of water per person (2 liters is recommended) and filled up the bottles from the river and lake using our Lifestraw bottles with filters. We prefer to fill up the bottles along the way rather than carrying all the water around. And of course a camera. Few people were using hiking poles but we didn’t find them necessary. The trail is mostly on dirt and the final stretch is gravel and rocks. Pack light and carry enough layers for colder weather. If you’re worried about the rain or you sweat a lot, you can leave some clothes on the bus and change when you get back so you’ll be dry and comfortable for the drive back to Huaraz. The minivan with our guide picked us up at the B&B at 6:30 in the morning. Our host prepared early breakfast but because of the altitude, we couldn’t stomach anything else than a cup of coca tea. We quickly picked up the rest of the group and headed to Yungay. Our small group of 8 was woken up when we passed Yungay and stopped for breakfast at a local outdoor bistro. The timing was perfect, just for a few soles and an hour before the hike we savored scrambled eggs with bread and coca tea. Bistro was well prepared for visitors and we also bought a bottle of coca tea, bananas, and coca leaves. As you can tell by now, we really emerged ourselves in the whole coca culture. 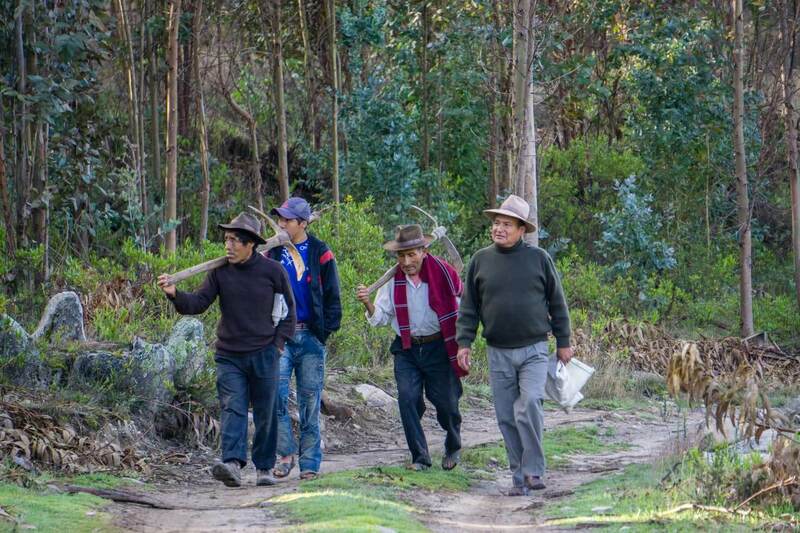 Peruvians from the nearby village were gathering near the road with pickaxes on their shoulders ready to be picked up for a day of work. We had plenty of time to watch how a regular day starts for Peruvians living in the mountains. While on the bus, we were glued to the windows the whole time, blue skies allowed us to see up close the countless peaks all around. 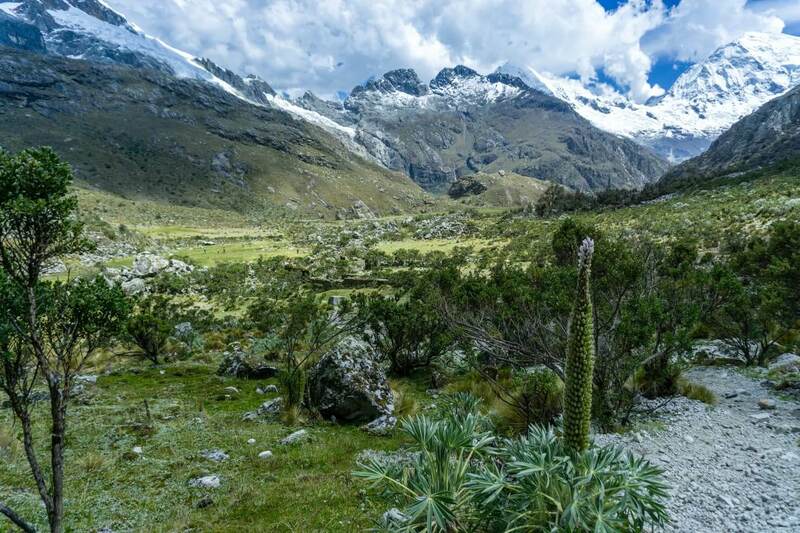 Soon we entered the Huascaran National Park which has an entrance fee payable at the gate. One day pass is 10 soles (3USD per person) but since we were planning to do more activities in the national park, we bought a pass for 65 soles (20USD per person) valid for three weeks. Passing the gorgeous Llanganuco Lakes, we stopped for a quick photo break and continued deeper into the valley. After 3 hours from leaving Huaraz, we finally started hiking. I could feel the anticipation from everyone, looking forward to a gorgeous sunny day in the mountains not knowing what exactly is ahead of us and a bit worried about the altitude sickness. The trail to Laguna 69 starts from the roadside at Cebollapampa (3,950m). If you are hiking without a guide, just stay to the right side of the river. Chances are you’re not going to be there alone, the trail is well-trodden and easy to find. The Laguna 69 trek has 3 sections slowly increasing in difficulty. The first part is the easiest because it’s mostly flat. Slowly stretching our legs from the bus, we were walking on the grass next to the river and countless cows along the way. As I was mesmerized with the views of more than 6,000m peaks, I almost tripped over the rocks several times. The landscape during the hike is breathtaking. 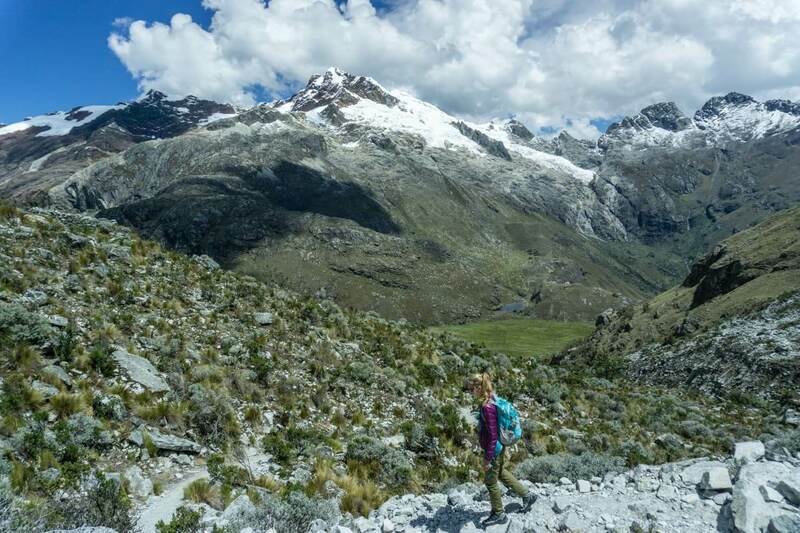 We were literally surrounded by the most beautiful and highest peaks of Cordillera Blanca. Huascaran (6,768m), the highest mountain of Peru first conquered by a woman climber in 1932 was right in front of us. The weather couldn’t be any better. We came in January, which is the rainy season, but we got lucky and had a clear blue sky all day. Just a few quickly passing clouds providing a little bit of much-needed shade. After a few kilometers, the trail starts to go uphill and turns into several switchbacks. That’s where everybody slows down significantly. The heart beats faster, you try to breathe fully, to breathe in more oxygen, but there is no oxygen left. The only thing that helps is making short steps and taking a lot of breaks. Just to calm down a bit, catch a breath, walk a bit and repeat. When your breaks are short and regular, they are very effective and you’ll be up in no time. The higher we got, the more the valley opened up and several waterfalls appeared. Whether we were short of breath or not, there were plenty of opportunities to stop while admiring the views and catching up a breath. The final section was a steep hike up the mountain. We knew the end is not far away. The best view comes after the hardest climb, right? The elevation was increasing rapidly and so did our breathing. We were walking up the mountain very slowly taking many more breaks. I was determined to continue and tried chewing some coca leaves to “ease the pain”. The leaves taste like, well, any dried leaves. They make a mess in your mouth and then you’re trying to spit them out for half an hour. I think I’m going to stick to the coca tea or buy a coca candy, coca gums, coca chocolate or anything else they have in town. Peruvians are pros and know how to form a ball in the mouth and keep the chewed up leaves together. My attempt wasn’t that glamorous. Michal burst out laughing when he saw me. We got a glimpse of the glacier and could see the lake. Our breathing and concentration were forgotten as we switched into a faster pace and huge smiles. We finally made it to Laguna 69! The magnificent turquoise lake was changing its shades of blue depending if the sun was shining or hiding behind the clouds. The ice and snow above the lake formed a glacier which was partially thawing, creating a tiny waterfall. It was time to sit down and have lunch. We were surprised nobody jumped into the lake, it was so hot. I guess people were recovering from the altitude and taking it slowly, we sure did. If we didn’t have any issues with the altitude, I’m sure Michal would jump right in. Some people were really sick, chewing coca leaves, drinking coca tea and looked like this is their final day. We talked to one guy who just flew in from England and went on the hike. He was feeling so sick from the stomach he didn’t enjoy any view and rushed down. You cannot underestimate the need of acclimatizing if you don’t want to end up feeling miserable and ruin your day. We only had half an hour break before heading the same way back. Going down was a breeze. The whole 14 km hike took us 3 hours hiking up and 2 hours hiking down. When we made it all the way down, few people from our group were already resting under the trees. Our legs were tired BUT we were just next to the river. We took off the shoes and cooled down walking in the knee-deep cold stream. I can’t believe nobody thought of that before. A cold dip is the best thing you can do to prevent cramps and soreness and we do it whenever there is an opportunity. It made all the difference. Our feet feeling fresh, we got on the bus and were handed water and a banana. Needless to say, we had a great nap on the bus till we got back to Huaraz. 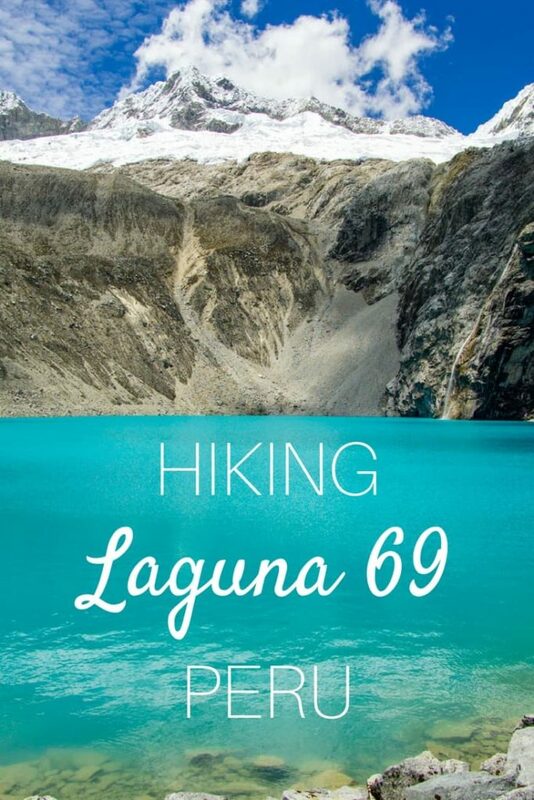 Laguna 69 trek is worth of every drop of sweat and every hard breath. Don’t think twice about going. Acclimatise before and enjoy! 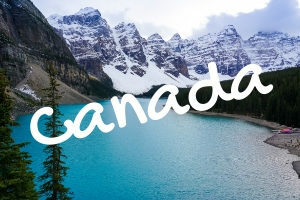 What is the bluest lake you saw? Have you tried high altitude hiking?